Two days after arriving home from Canada and USA, I was on the road back to Sturt. On the way, I stopped off at the opening of Exposition in Warwick Regional Art gallery. In fact Glenys Mann and I co-opened it with a discussion on how it came about, the artists involved and the response to the concept. It all began about 2 years ago with a drive. 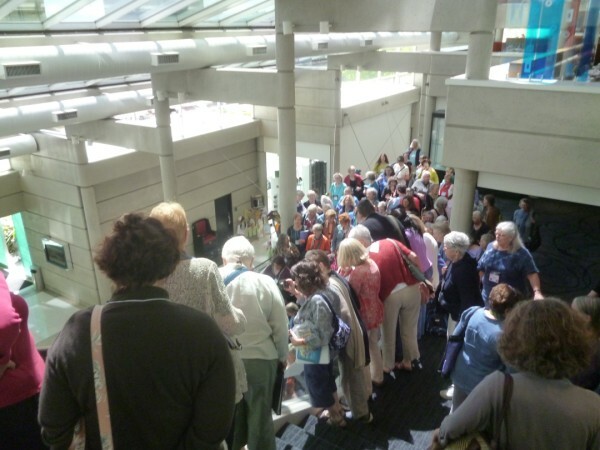 We were on the way to Warwick for me to open Glenys’s exhibition. Somehow the idea was mooted that it would be fun to gather a group of artists from across a range of media and see how individually each would respond to a common theme. 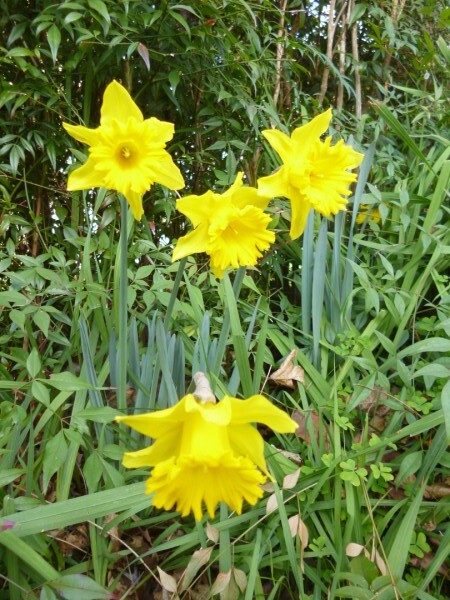 What sort of theme: a word or group of words, an image? This is what transpired. The title was chosen: Exposition. The Shorter Oxford Dictionary of 1933 provides the meaning: “The selection of some sensible object, in order to prove a general relation apprehended by the intellect.” An image was chosen for the artists to respond to. These are the exhibiting artists: Cass Holmes, UK; Deb McArdle, Aust; Diane Savona, USA; Dionne Swift, UK; Elizabeth Lada Gray, Aust; Estelle Virgen, Aust; Heike Gerbig, Germany; Mary Hettmansperger, USA; Pamela Fisher, Aust; Glenys Mann, Aust. and myself. The range of work is amazing. Some responded directly to the image, others used an association of ideas, some responded to the words. I am unable to share images of all the works. Glenys obviously responded to the image with her works titled Tag. One of the narrow often pointed pendent pieces made by slashing the skirt of a garment; hence any hanging ragged or torn piece; also, any end or rag of ribbon or the like. A small pendent piece or part hanging from, or attached more or less loosely to the main body of anything. A point of hard substance at the end of lace, string, strap or the like to facilitate its insertion through the eyelet-hole, when externally visible, often ornamental. To furnish or mark with or as with a tag (in various senses). To append as an addition or afterthought: to fasten, tack on, or add as a tag to something. To fasten or tack together; to join. To join or string together. 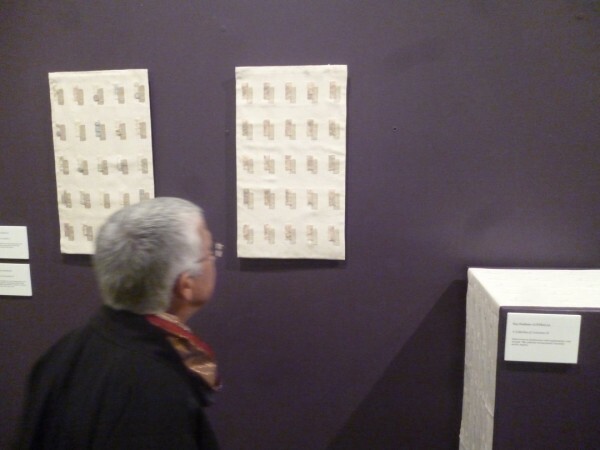 Truda Newman in front of my works: A Collection of Curiosities I, II, III. 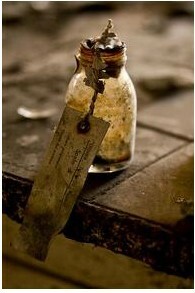 My artists Statement: This bottle speaks of times past. It reminds me of bottles arranged on country museum shelves, dusty bottles left on shelves and found hidden away in cupboards in old family homes. It also reminds me of other containers used in the same way: wooden boxes, shoe boxes, jars and my Dad’s baccy tins. Labels, if they are still attached are tied on with bits of string or with yellowing peeling sticky tape; the writing spidery, faded, indecipherable. Maybe they contain something and maybe there are traces of what was in them. Sometimes these bits and pieces were left over from past projects or acquired and stored because they might be useful. Sometimes one comes across real treasures: a lovely collection of buttons or old coins perhaps. I have containers of odds and ends, things I couldn’t bear to throw out and things that I might need sometime in the future. I have containers of various bits of hardware: nails, screws and washers and fishing gear kept in plastic film canisters. I have my Dad’s baccy tins, bottles and jars of all shapes and sizes holding all manner of useful sewing items, art supplies, heirlooms. These curiosities have been inherited or collected over my lifetime. There are two elements I wished to identify in this series: the bottle/container and the label. The fabric has been woven in doubleweave allowing pockets to be formed to hold various items: curiosities with the “indecipherable” label being represented by the superimposed inlaid brocaded shapes. Details of two of the works. The exhibition continues till the 17th August 2014. I would like to acknowledge the gallery staff as they have done a wonderful job in the presentation of the exhibition. Back to Sturt and the start of term. Students are working on a variety of pieces in a wide range of techniques: some are specific projects, others are samples exploring various techniques. Some were begun last term so will be finished soon. 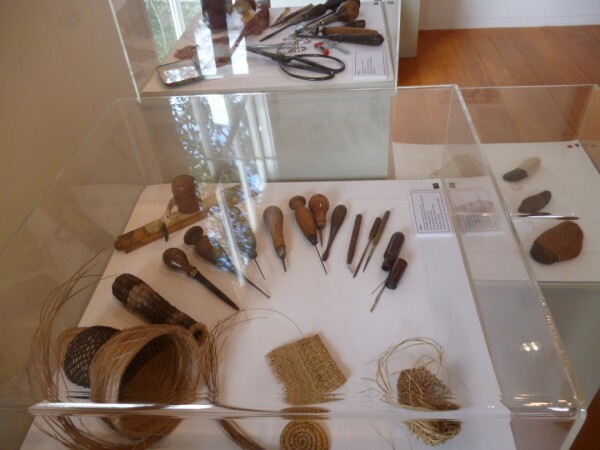 This last weekend saw the opening of a significant basketry exhibition at Sturt. It is a retrospective of Virginia Kaiser’s work. 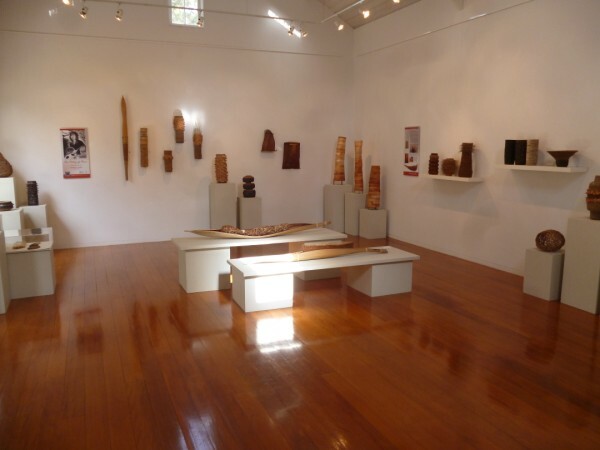 Virginia’s career spanned over 30 years and as the curator of the exhibition, Slavica Zivkovic, writes in the catalogue “The Poetry of Place is an exhibition by one of Australia’s foremost contemporary basket-makers, who will be remembered for her integrity of practice and her innovative techniques.” Some of the baskets are from her estate while others are from acquired collections. 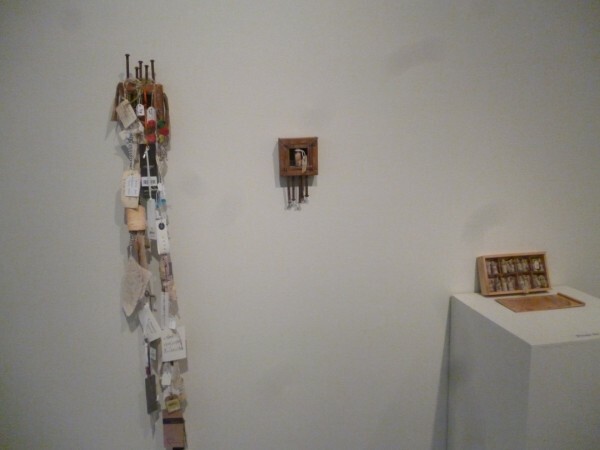 In addition the exhibition includes materials and equipment she used and drawings from her notebooks. It is an extremely comprehensive and well produced exhibition. Eventually it will go to Broken Hill, where she had her studio. 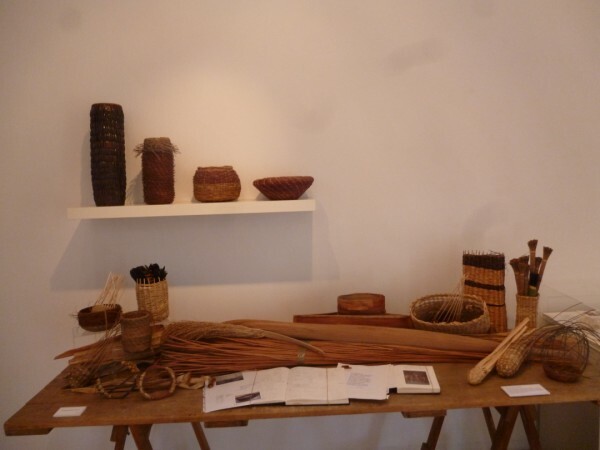 A number of basket making workshops were run to coincide with the opening. Sturt was a very exciting place to be. 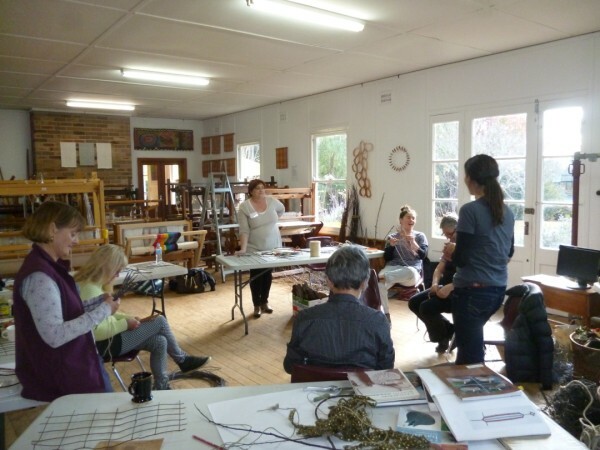 The weaving studio hosted 3 x 1 day worksops. I enjoyed seeing the hive of activity as I passed through. 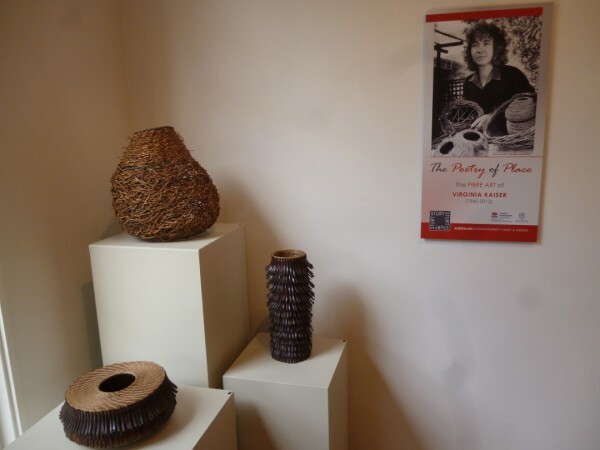 Harriet Goodall and “On the Wall- Basketry beyond the vessel. What is the craft of being human? The material, myself, that I have to work with constantly changes. 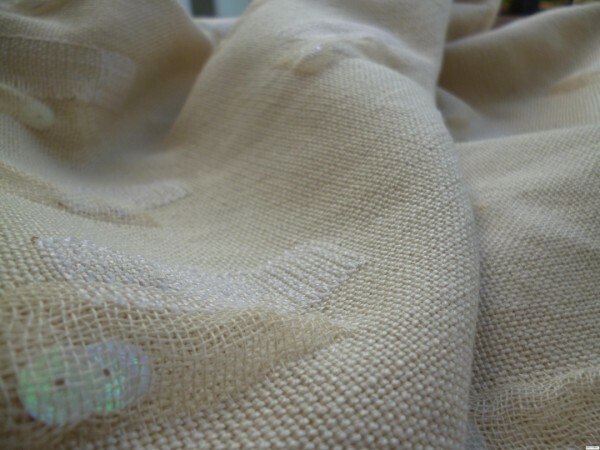 It has qualities of clay, glass, metal, wood, fibre, wool; it is brittle, flexible, malleable, obdurate. It is as if the study of being human is the ultimate craft and all the crafts reflections of it. The Work of Craft, Carla Needleman. The term ended with a flurry of activity with many projects being completed. Tuesday finishes a wrap woven in a loopy mohair and fine wool. 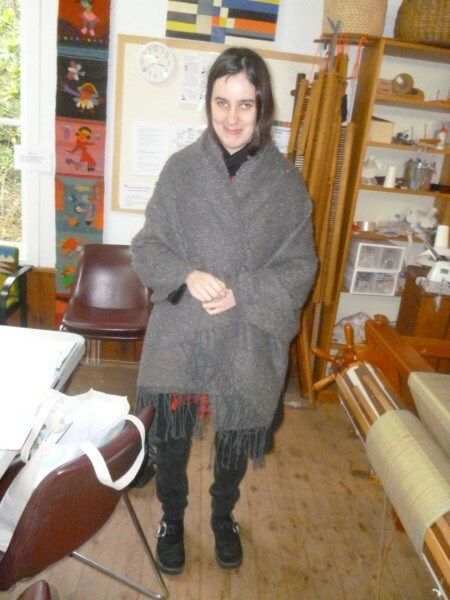 Pauline finishes another scarf. The ends still have to be twisted. 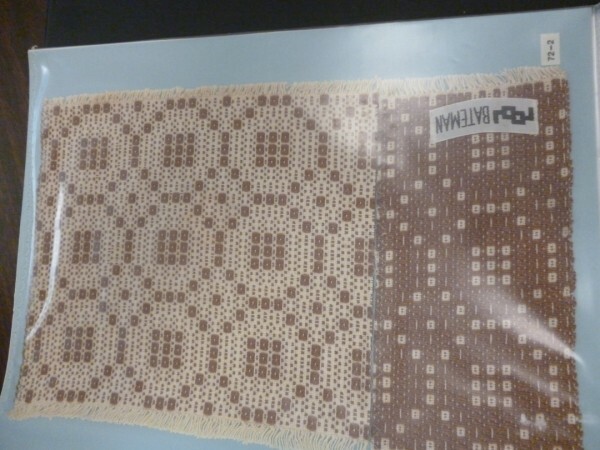 The yarn used for the weft came from one ball of knitting wool. The ball of commercial wool had four different yarns knotted together. Pauline separated these as used them as separate stripes. Isobel finishes a colour and structure sample. Bev finishes a length of plain weave. She intends making placements with embroidered hand worked hems. A new loom has been donated to Sturt. 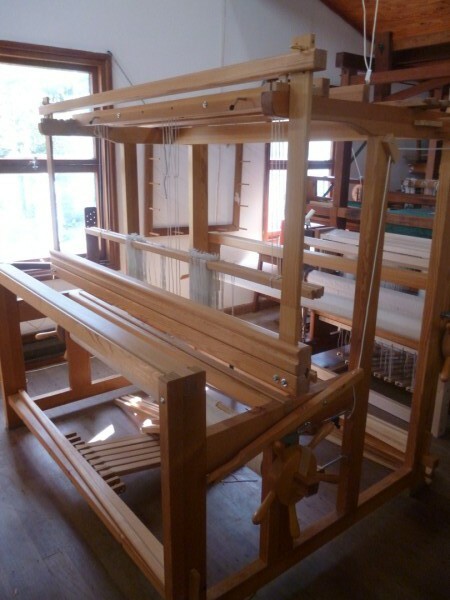 Currently the countermarche loom has only 4 shafts. There is space for twelve. 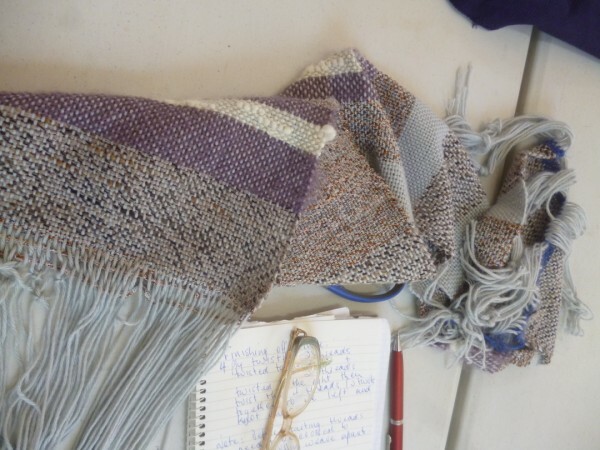 A group project will be first woven commencing at the start of next term. Thanks go to the Moffett family for this very generous donation. At the end of term, I had a few days at home. Some English relatives visited. 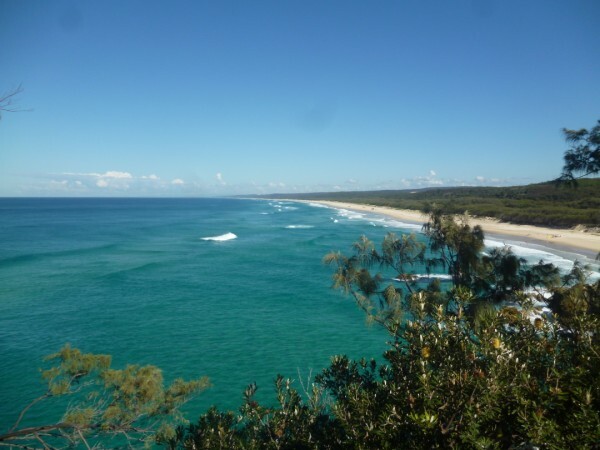 We spent a stunning day at Stradbroke Island. You will just have to believe that we saw a very spectacular display by a pod of Humpback whales. I was so enthralled that I forgot to photograph. 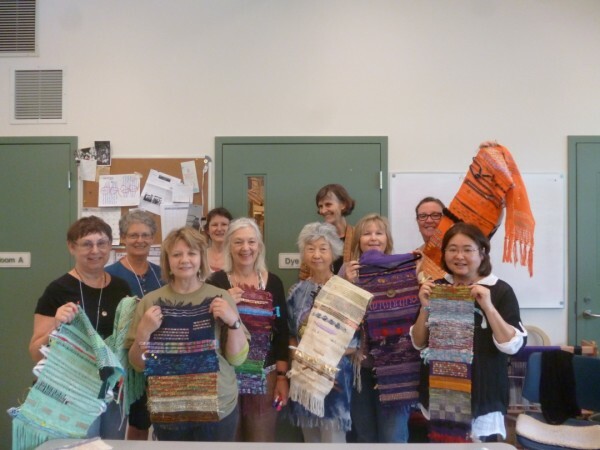 Then there was the highlight of the month: Complex Weavers Seminars. They are held every two years in various locations, usually in the USA. 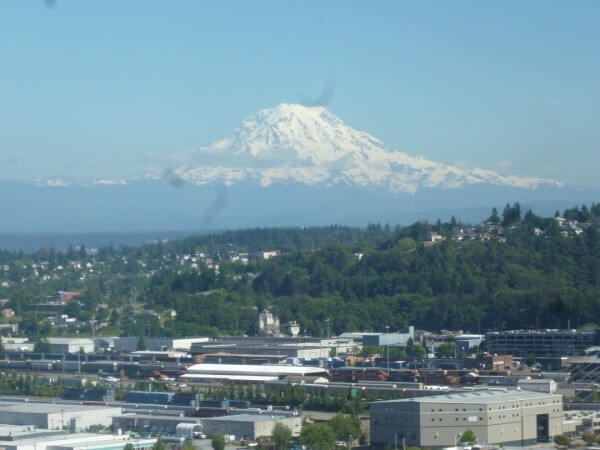 This year they were held in Tacoma in the Hotel Murano. The Hotel had displays of glass on every floor and in public spaces. This was located in the foyer. An attempt was made to officially record the attendees. The official photographer stood at the bottom of the grand staircase while everyone crowded on the stairs. There were just too many to fit. I was at the top looking down and only caught a fraction of the crowd. Judith Krone and I completed another challenge. The theme for this year was set at the last Seminars, two years ago, and was “black and white stripes”. We each wound a warp of two scarves in 2/20 silk. 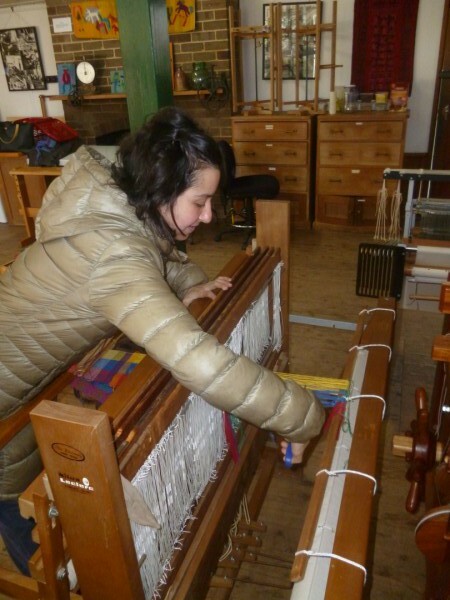 Last year we exchanged the warps and then had a year to weave the challenge. We could do whatever we wanted. 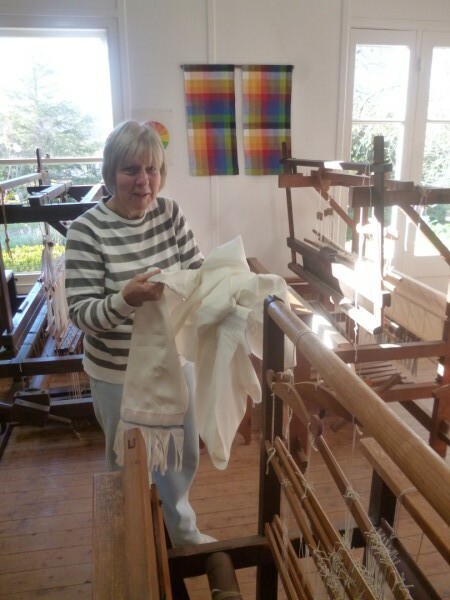 Judith chose to do some traditional shibori after she had woven the scarves. She gained a very unexpected but delightful effect caused by the separation of the black dye. The front and back of the scarf are totally different. 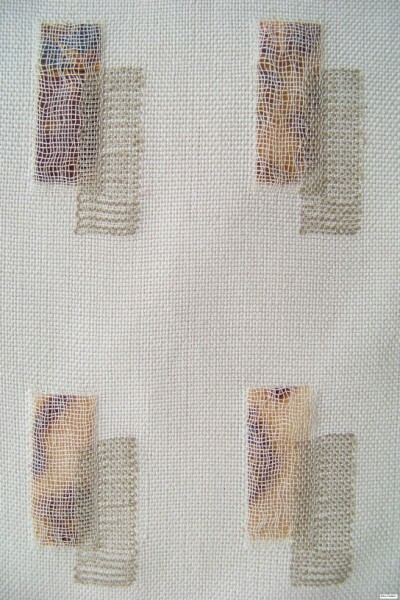 I chose to weave mine in a plaited twill with woven shibori. Mine also provided an unexpected result. The dye used for the black stripe had an acid base while I also dyed it with a soda ash (alkaline) procion. When discharged the dyes were removed at different rates. 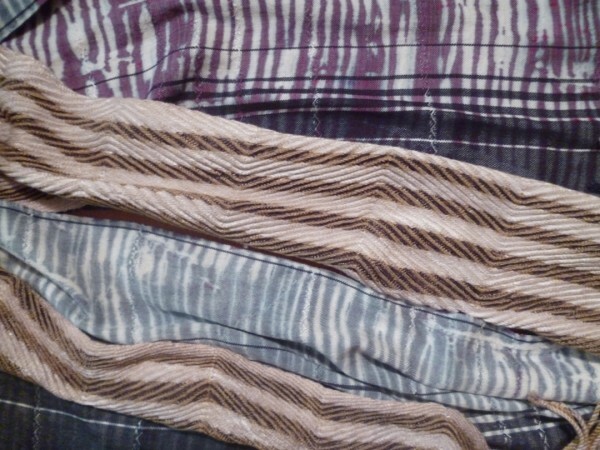 I decided that I would leave in the pleats even though the dye pattern/effect is less noticeable. At the time I had great difficulty in deciding whether to iron them out or leave them in. They will drop out over time as silk will not hold permanent pleats. We had a bit of fun presenting the Challenge in the fashion parade. Mt Rainier was on show each day. This is the view from my room. Post Seminars was the opportunity to go on a tour to see the work of Dr Bateman. 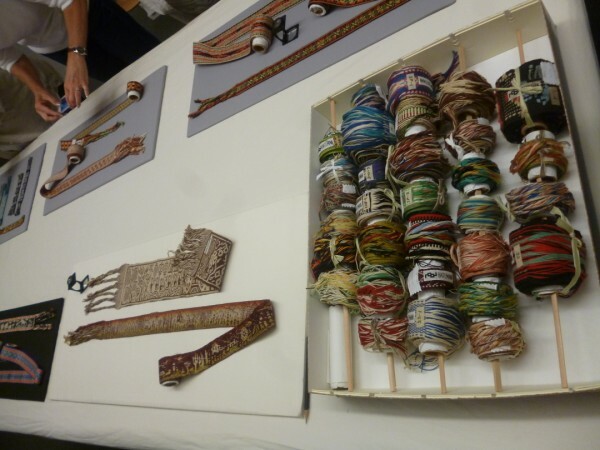 Firstly there was the collection of some briads and woven textiles inspired by South American textiles. The Museum had brought out some of their collection. 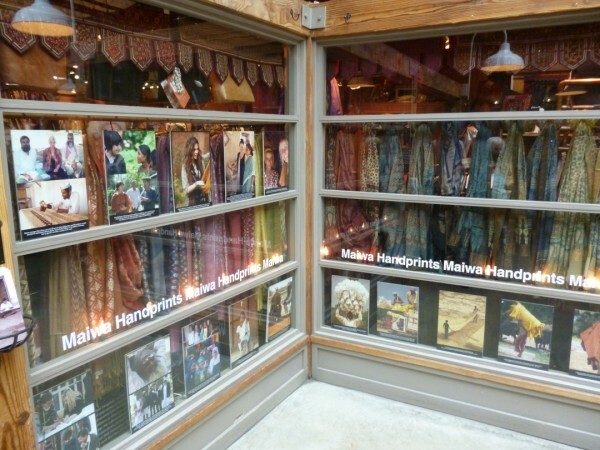 Then onto the Seattle Guild who have several binders of his work. It is amazing to consider how the quantity of sampling he did in his retirement. 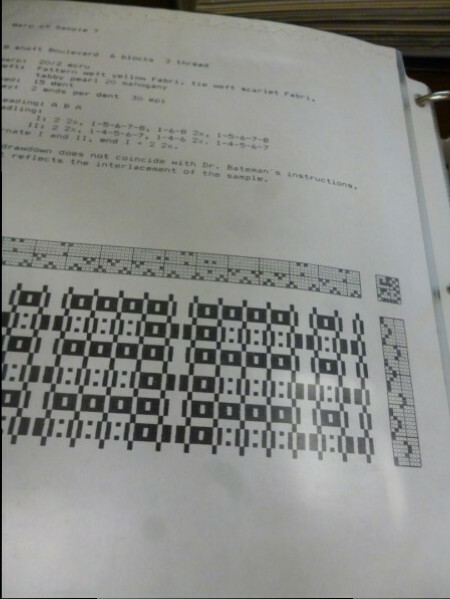 The binders include drafts based on his records followed by the samples he wove. 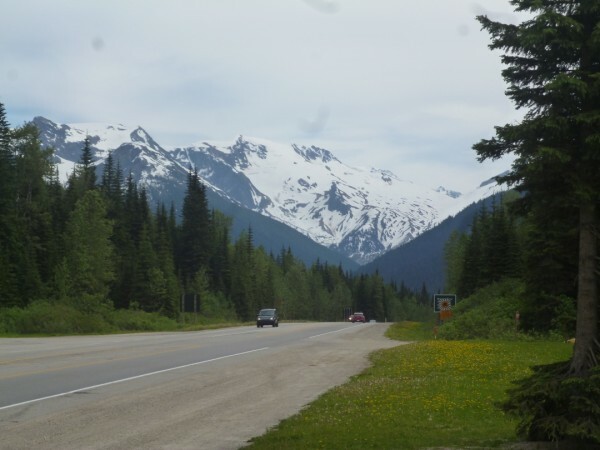 Following the Seminars, I had some time out driving through the Rockies with two friends. The discussion started at the Seminars continued in spectacular scenery. 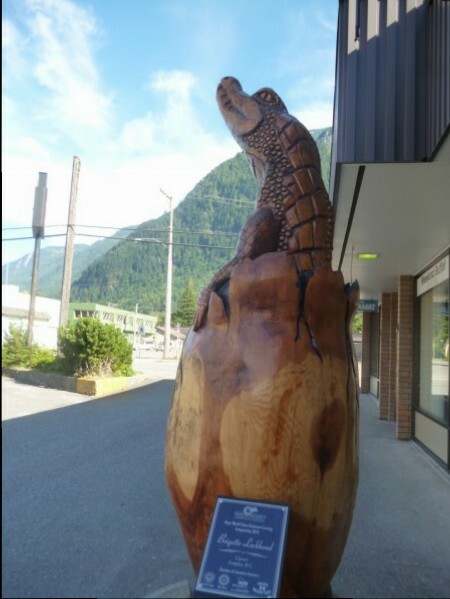 Hope, a town where we stayed, had very interesting sculptures created by artists wielding chain saws. 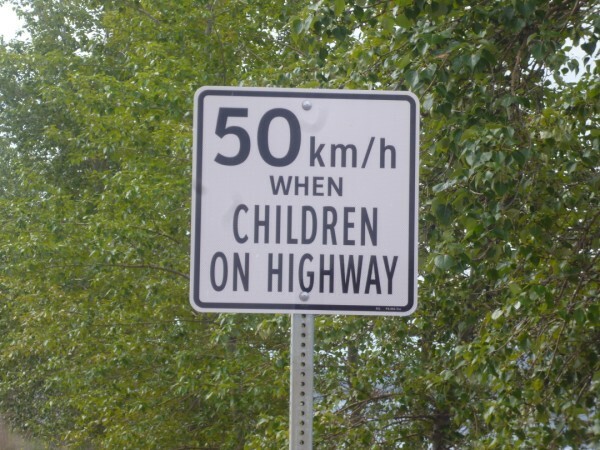 An interesting sign? It made us smile. 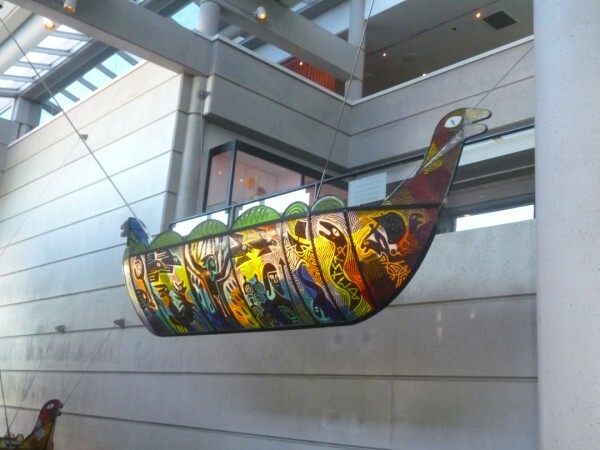 Then in the terminal at Calgary I found this. It was the start of the Stampede. 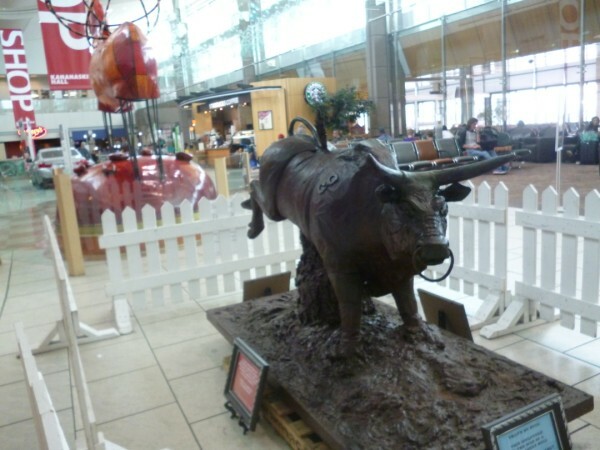 The sculpture is made from 500kg of pure chocolate! I have followed the progress of Maiwa for many years. www.maiwa.com. 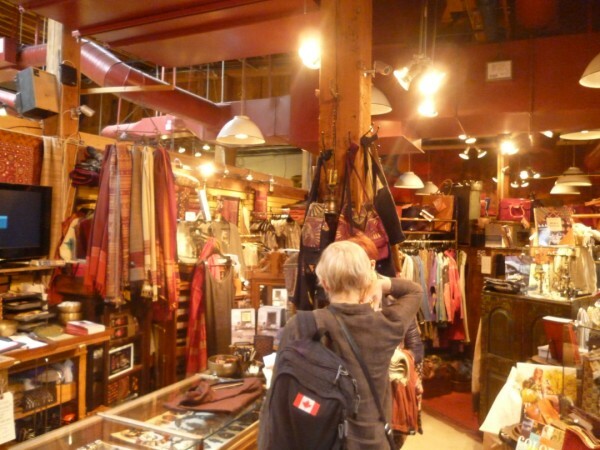 Of course I would make the effort to go there: to look, to shop and to say I’ve been there. 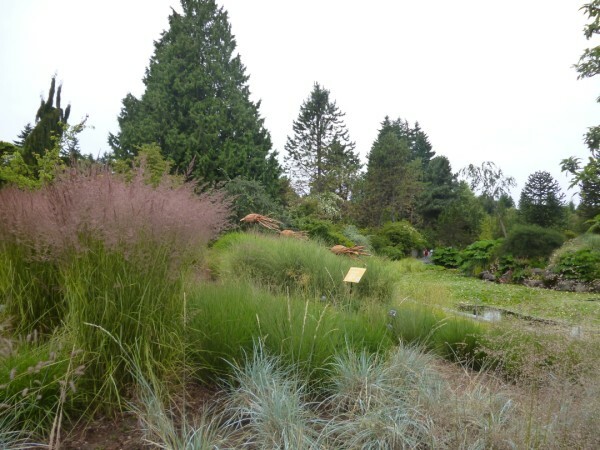 A visit to Van Dusen Botanical Gardens where as well as seeing a beautiful garden, I found squid swimming in the tall grasses. The trip concluded with a workshop with the Richmond Guild with a workshop; Recycle! They brough along a very interesting collection of “stuff” to explore structure and design approaches. 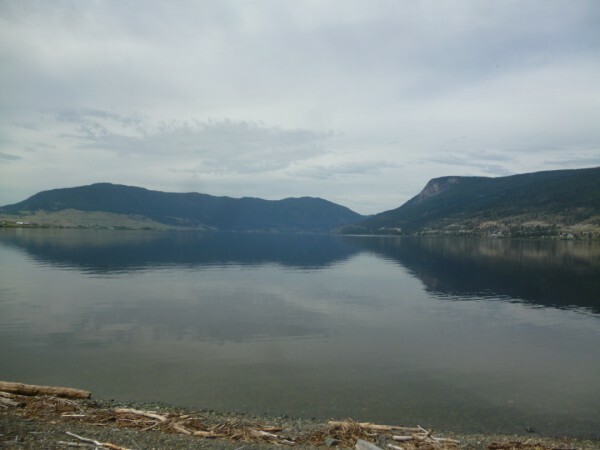 You are currently browsing the Kay Faulkner's Blog blog archives for July, 2014.